travelling with. 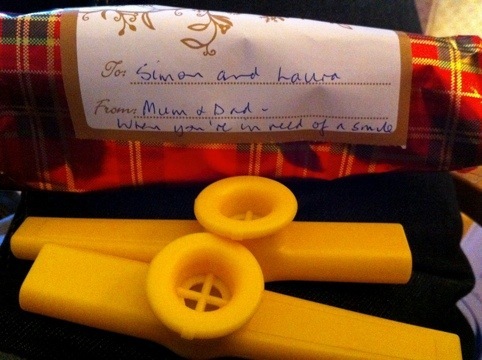 So when Simon’s Mum bought us a kazoo each for Christmas, it was ideal! This also fits pretty nicely with our attempts to travel light – as much as we’ve always wanted to learn the double bass and harp, they’re not quite as portable. Of course, having an instrument is just one part of the challenge. It turns out that one actually needs some music to play on it too. Those who came on the canal boat trip before we left will know that we’re working on our repertoire – but great things only come with time, and so a little patience is required. Alas, ear plugs are also handy for anyone within 100m due to the stunning range (distance, not musical) of our ‘music’. Suggestions on suitable kazooable pieces are very much appreciated. There’s only so far we go with ‘Oh when the saints go marching on’ – and we didn’t feel that ‘God Save the Queen’ was quite as appropriate! The final piece to the kazoo orchestra is of course decoration – what ensemble could possibly be complete without beautifully hand painted instruments? Laura’s kazoo has seen the artistic treatment (and is clearly more sonorous as a result). Simon is currently using the lack of such colour as his excuse for playing out of tune – consider it a work in progress!